The Axolotl is a type of salamander. They are often mistaken for Waterdogs. They are closely related to Tiger Salamanders. The size of them can range from 6 inches to 18 inches long. They are often called fish but they don’t fit into that classification as it is actually an amphibian. The body is a grayish color with small gills. They also have appendages that allow them to walk along the bottom of the water. They have a flat face with blue eyes that are large with black pupils. You will notice that they don’t have any eyelids. They have a very wide mouth and under the belly is a white or yellow color. Some of them are white in color due to genetics. They are only considered to be albino though if they also offer white eyes. The white coloring is very unique because most of the time they won’t survive. They don’t blend into their surroundings well enough. The white comes from recessive genes from both parents that can result in the trait being dominant in some of their offspring. They are found in Lake Xochimilco and Lake Chalco at Mexico City. They tend to live in bodies of freshwater. In Mexico though many of the lakes that they once inhabited have dried up. This is due to changing climates and even areas of humans moving into locations that were once left alone for aquatic life. They can only thrive in bodies of water that are very clean. The Axolotl is a very common pet and does well in captivity. If you decide to keep them as pets you have to be ready for their needs. If they don’t have the right care and environment then they may refuse to eat and then die. 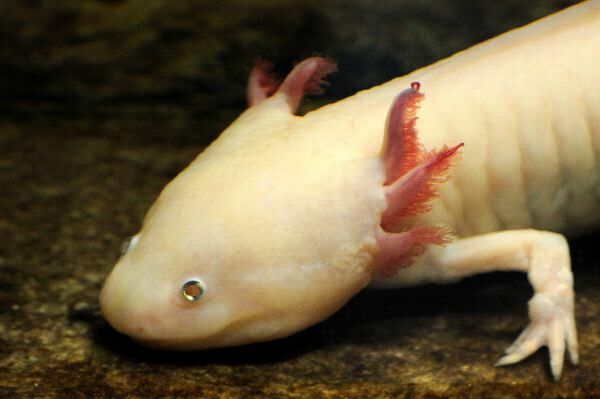 What is very interesting to experts is that the Axolotl is able to regenerate body parts. When they are attacked by predators they can release one of the appendages to escape. Before long that appendage will grow back. They can be boring to watch though as they often don’t move for several hours at a time. When they do move they are slow. They will consume a variety of crustaceans and small brine shrimp in the wild. They dive at food and consume part of it. Then the rest of it is left floating around the area. It will be used to feed other living organisms though so it is all a part of the chain of life that occurs in the bodies of water. Strips of beef and liver are often given to Axolotl that are pets. Other sources of food that work well are worms and brine shrimp. The tank has to be cleaned often though to remove any remaining food. Otherwise the Axolotl can become ill because there won’t be other organisms that consume those remains. The Axolotl is mature for mating at the ages of 1 year of age. The females can lay up from 100 to 300 eggs per season. There isn’t very much known about what draws mates to each other. The females will do their best to place the eggs in locations where predators aren’t going to be able to get to them. A typical lifespan for the Axolotl in captivity is 6 years. The status for the Axolotl at this point in time is Critically Endangered. They are in danger due to the high levels of pollution that have been increasing in the bodies of water where they live.